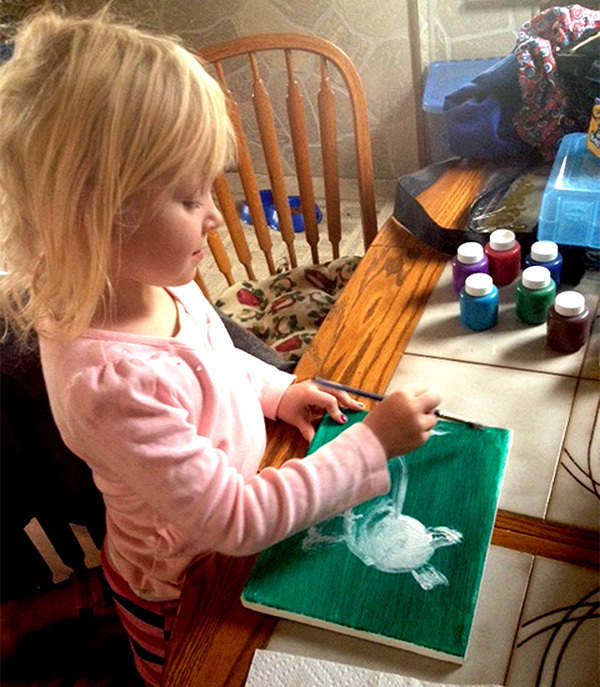 Four-year old Jayla Glemba of Charleroi is a budding artist whose paintings are the cat's meow. Shy at first, she will tell you that she knows her simple acrylic creations are raising money to help cats like her beloved pet, Gnarly, who was once a homeless tomcat. What she may not understand, explains her mother, Kristin Glemba, is the magnitude of the amount raised — more than $775 last week — through a Facebook auction. "She knows the money is going back to help other cats, but she doesn't know how big it is," Mrs. Glemba said. The proceeds from five paintings and donations from additional commissioned works will go toward the Homeless Cat Management Team of Pittsburgh. With a clinic in Tarentum, the nonprofit's mission is to halt the overpopulation of companion animals in the Pittsburgh area by providing high-volume, high-quality, low-cost sterilization. "This instantly took off. A couple people asked if they could get paintings of their own cat," Mrs. Glemba said.